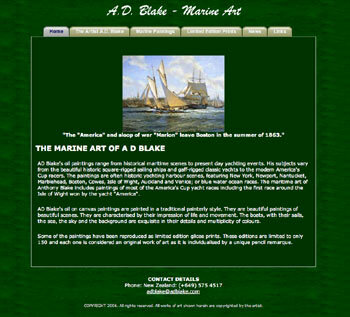 New Zealand artist A.D. Blake is one of the top five marine artists in the world. His historical marine oil paintings range from gaff-rigged classic yachts and square-sailed sailing ships, to historical America's Cup races and contemporary sailing scenes. His maritime art is painted in a traditional style showing the beautiful details of the yachts and their rigging, and the paintings are often historic yachting harbour scenes, or blue-water ocean races.